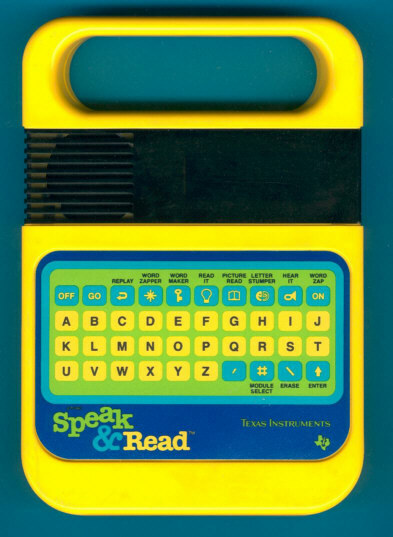 This Speak & Read model from the year 1986 got a slightly changed keyboard design. View the original Speak & Read here. Other products in the Speak & line cover spelling words and math. Compare this Speak & Read with both Speak & Spell and Speak & Math. Dont't miss the appearance of the Speak & Spell in the movie „E.T. - The Extra-Terrestrial“. Do you know Qubais Reed Ghazala ? Get more tunes from your Speak & Read with circuit-bending. Few years later the Super Speak & Read with the position sensitive keyboard technology was introduced. In 1986 we knew a total of 8 different plug-in modules for the Speak & Read, a comprehensive overview including the wordlists could be found here.